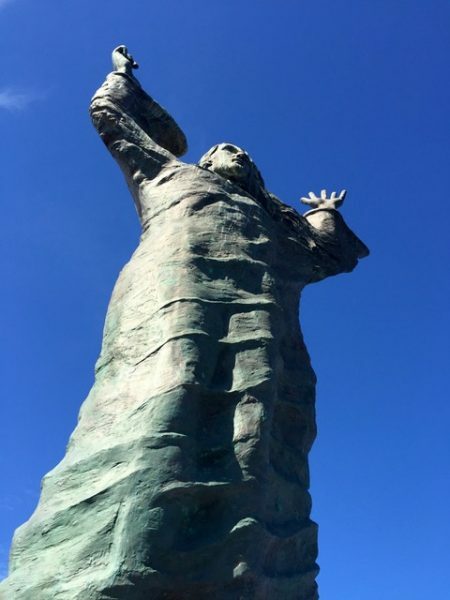 Christ the Redeemer statue at the marina entrance, Torre Del Greco. Photo by Rebecca Di Donna. Torre del Greco, a comune of Naples, sits in the shadow of Mt Vesuvius. Up until the early twentieth century, it was a resort for wealthy Italians and tourists seeking to climb Mt Vesuvius. Today it is a gritty, blue-collar town, not concerned with packaging itself for outsiders, which is quite refreshing. 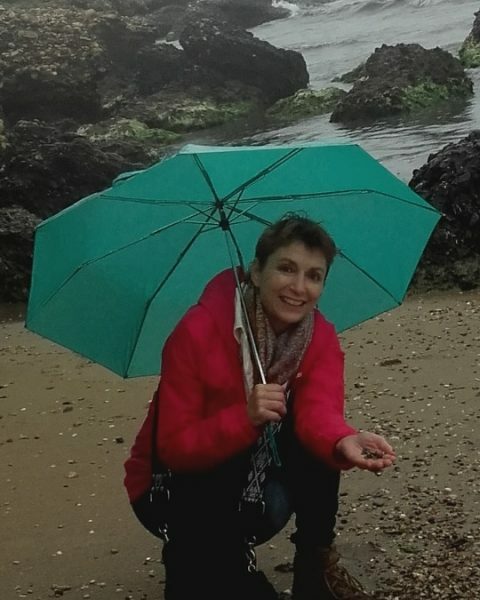 We went there to meet an online friend from the sea glass world, Rebecca Di Donna. She and her husband, Paolo, invited us to their apartment for a late lunch after we finished seeing Pompeii. Dennis and I got back on the Circumvesuviana and rode a few stops down the line, toward Naples. We got off the train at Torre and started walking toward the Marina, somehow managing to get lost even with directions. Being “lost” is a good way to find your way around! 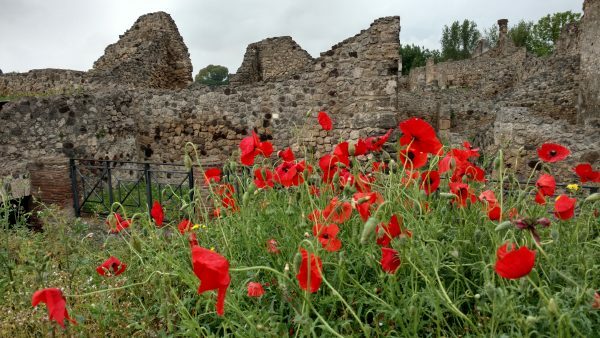 As we walked through the town I thought about its close neighbor, Herculaneum. Once a city of wealth and prestige, it was completly destroyed when Vesuvius erupted in 79 A. D. Torre del Greco was lucky that day-spared by the gods, so to speak. Natural disasters are kind of personal to me. I was living in Washington state when Mt. St. Helens erupted in 1980, and remember the uprooted forest trees stacked like pick up sticks and mountains of volcanic ash along the interstate. Thirty years later I still live in Washington state, on a beautiful peninsula that happens to be in a tsunami zone. With proof that an earthquake and tsunami wiped away much of the area in the 1700’s, we live with the knowledge that its “not if, but when”. Still, we go about our daily lives and try not to obsess about the future too much (at least I don’t). Is that how it is to live here? 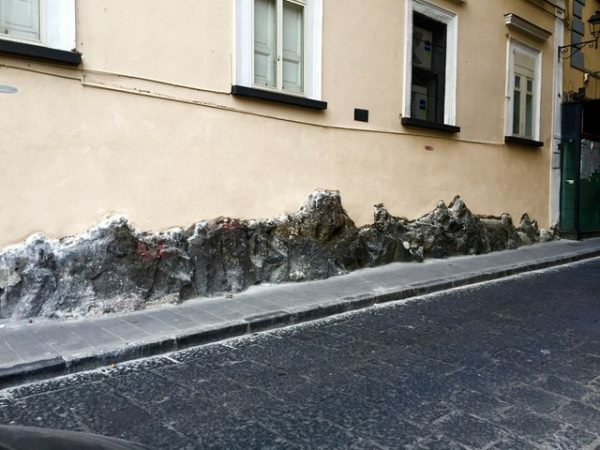 I wondered, as we walked by signs of past volcanic eruptions. Times change, of course, but the basics of everyday life; eating, drinking, working, praying go on. Like their ancestors, the modern inhabitants live their lives within the shadow of an active volcano. 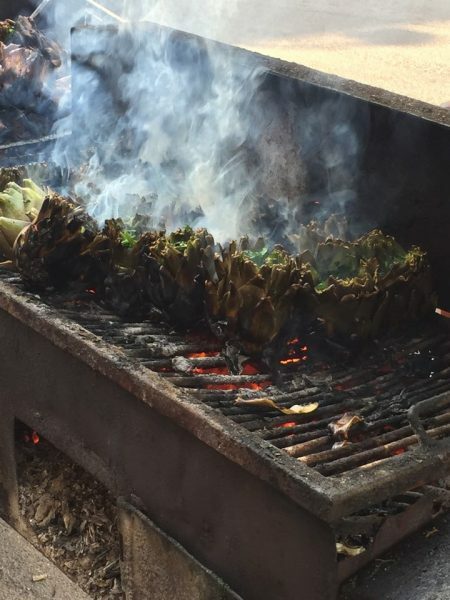 The fertile (volcanic) soil produces the most flavorful produce and wines, which we were about to experience firsthand at the lunch that awaited us- but we were still lost. There is a coral museum in Torre that I really wanted to visit, but it was closed the day that we were in town. 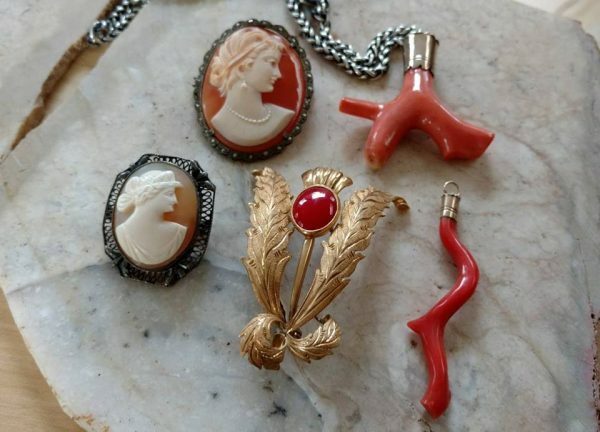 The most beautiful coral comes from the nearby Mediterranean sea, and an industry sprang up here in the 1700’s producing cameos and jewelry from the vibrant red and orange branches. Coral has been used for adornment and worn as a protective amulet for centuries. On a personal note, I have always loved coral ever since I was a teenager and a package arrived from Italy containing a box of Altruda family jewelry. The cameo’s and broach belonged to my great aunts. There were seven coral amulets, worn by my grandfather and his siblings when they were children. 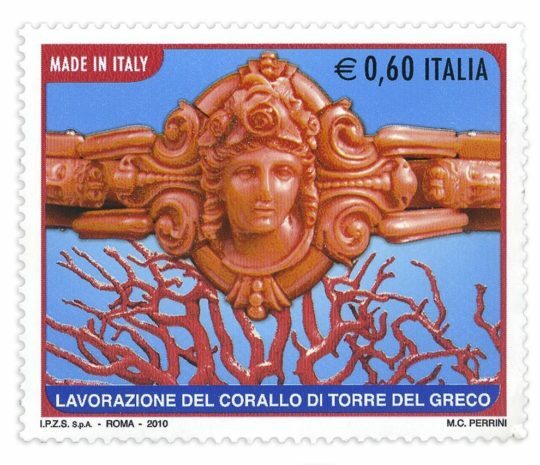 The residents of Torre del Greco are called corallini, in reference to the cameo and coral jewerly industries located here. As we walked toward the Marina (the long way, I’m sure), I had to stop to photograph the details we passed along the way. 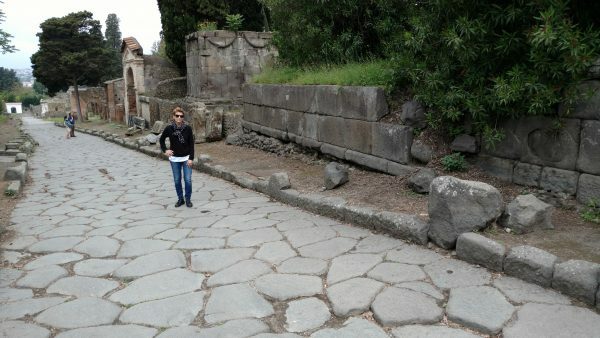 I was hoping we would find Rebecca’s apartment before too long, as we had already walked miles on the hard paving stones of Pompeii. We were ready for a glass of wine and a snack! The influence of Egypt was popular centuries ago in Pompeii, and today, in Torre del Greco. 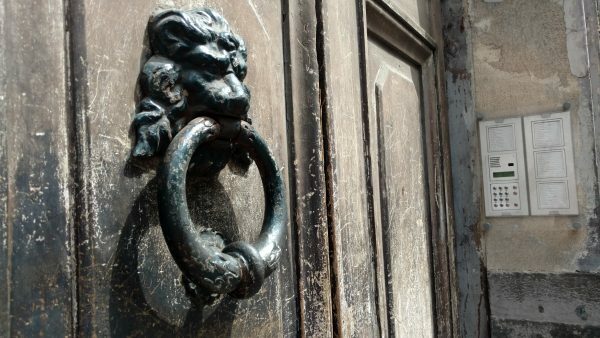 Doorknockers are one of my favorite things to photograph! 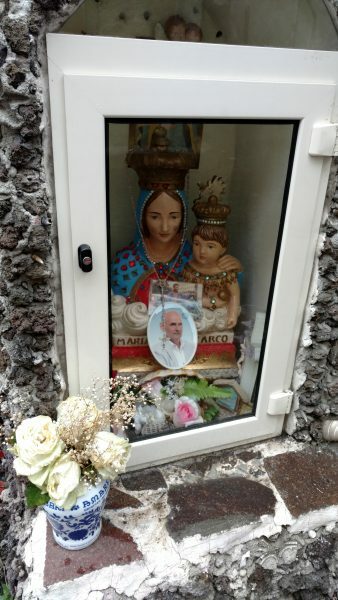 One of many neighborhood shrines. The influence of religion and ritual are very much alive here. Street processions, singers, submerged statues in the marina for protection- yes, protection would be very much on the minds of people at any time in history who lived here. At last, we found their apartment address and rang the bell. No one answered. Two boys from across the street watched us and then came over. They confirmed that our friends lived here, and then they rang as if that would produce better results, but no dice. Not sure what to do next, we walked over to a nearby bench facing the harbor, and sat down. Very soon a man on a Vespa rode up and asked if we were Judith and Dennis. It was Rebecca’s husband, Paolo. They had been looking for us! View of the harbor with the statue of Jesu, as seen from their living room. Not pictured: Mt Vesuvius-it was too cloudy. 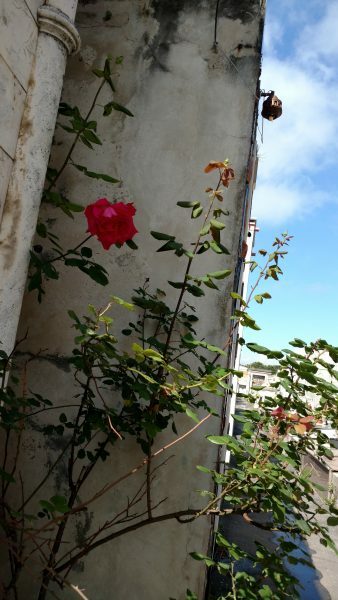 We were brought upstairs to the top floor apartment of a six-hundred-year-old building. Rebecca and Paolo, whom I had never met in person before, seemed like old friends. As with other people I have met from the sea glass world, we already had a lot in common. Soon we sat at their table and had the beautiful food prepared by Chef Paolo for our lunch. 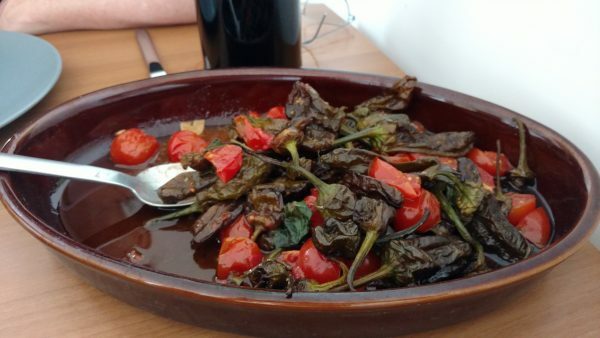 Fried peppers and tomatoes, cooked in locally produced olive oil. 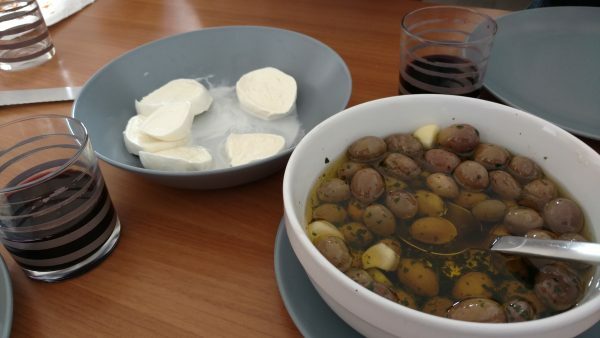 Fresh mozzarella di bufalo, olives, bread, and wine, all from the local area. What more does anyone need? 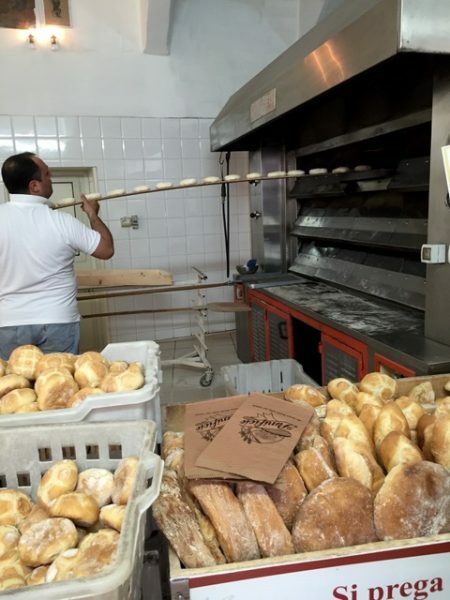 Bread baked that day at their local bakery. 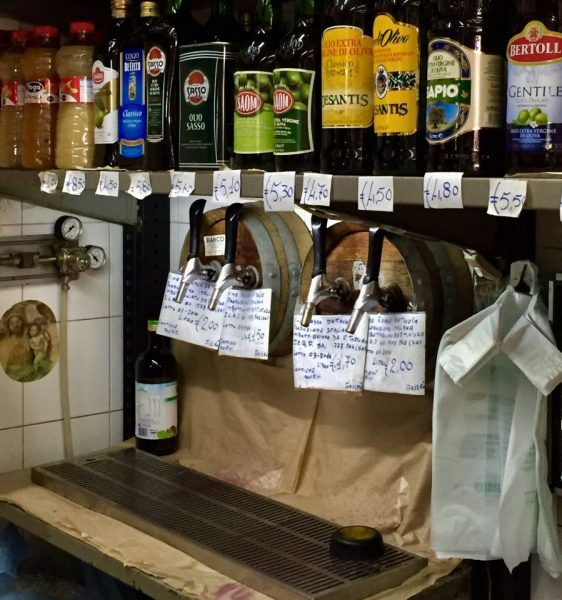 They fill their glass jugs at the local cellar with wine from a vineyard near Mt. Vesuvius. As we sampled the delicious food, conversation flowed like the hearty Vesuvian wine. Paolo, who is from Capri, is a professionally trained Chef. He had lived in the States for a number of years, and was working at a restaurant in Santa Barbara when he and Rebecca met. 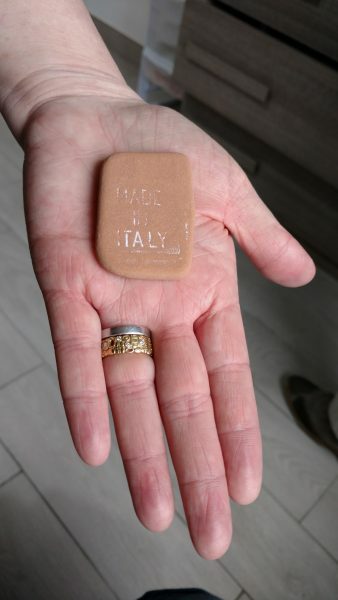 They hit it off, married, and moved back to Italy about five years ago. Our visit included a show and tell of sorts. I showed some of my sea glass and ancient coin jewelry. Rebecca, an artist, showed us some of her mixed-media pieces hanging on the walls of their home. Her creativity overflows in everything she touches, be it painting, photography or lifestyle. 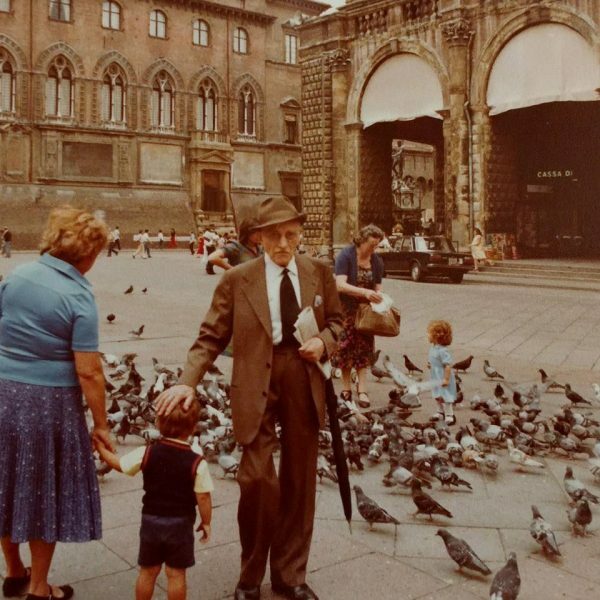 Many of her photos of everyday life are included in this post. Thank you Rebecca! 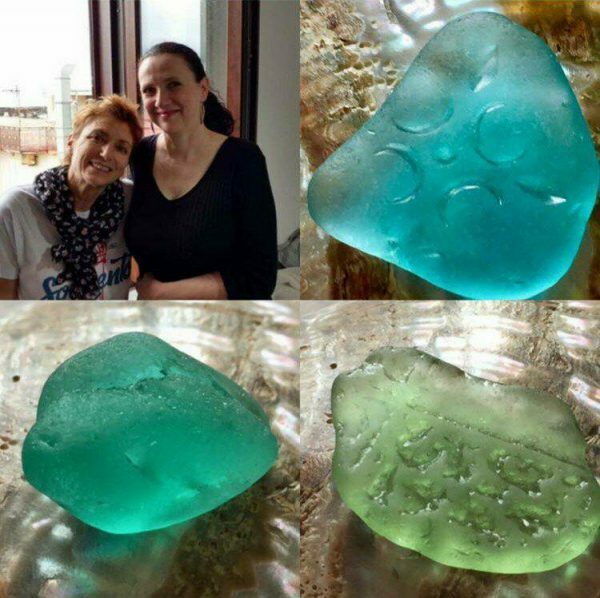 Privacy screen glass, once used in bathroom doors and windows, turned into sea glass and found on the beach by Rebecca, photo by Rebecca Di Donna. I drooled over her Italian sea glass and pottery collected on Capri and all over the Mediterranian. Of course, we had to do some trading! Grazie Mille Rebecca and Paolo-ci vediamo lánno prossimo! Before it got too dark, Dennis and I started back for the train station. This time we had better directions and made it there in about ten minutes. We got on the train for Sorrento, tired, content and happy. We could not stop talking about our visit, rehashing Paolo and Rebeccas’s incredible hospitality. 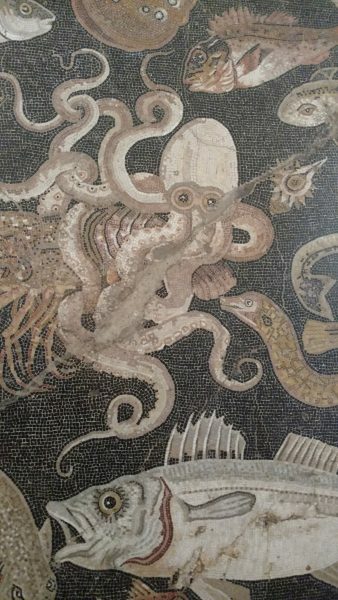 I will definitely return to Torre del Greco on a future visit to see the coral museum. Hopefully next time the sun will be shining so I can actually see Vesuvius! 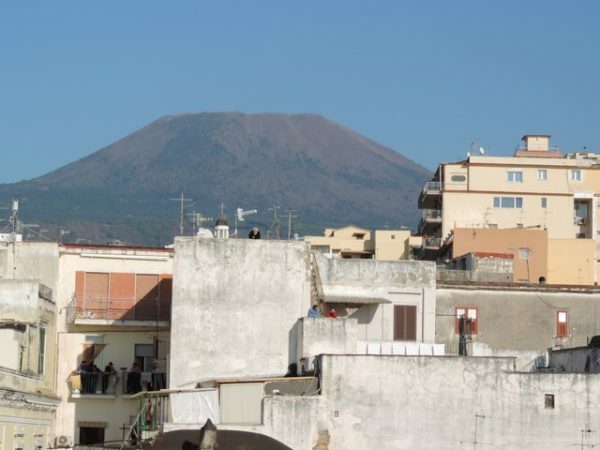 Vesuvius as seen from their apartment-photo by Rebecca Di Donna. 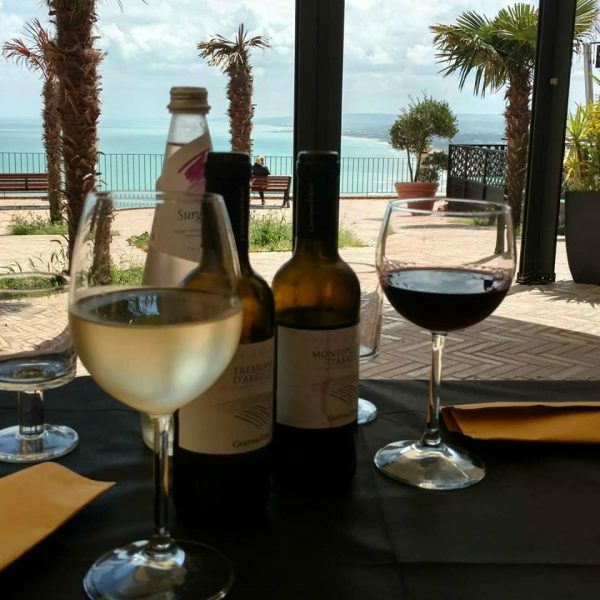 This entry was posted in Inspiration, italy, sea glass, travel and tagged coral museum, food and wine, judith altruda, Torre del Greco. Italian coral on July 3, 2018 by admin. 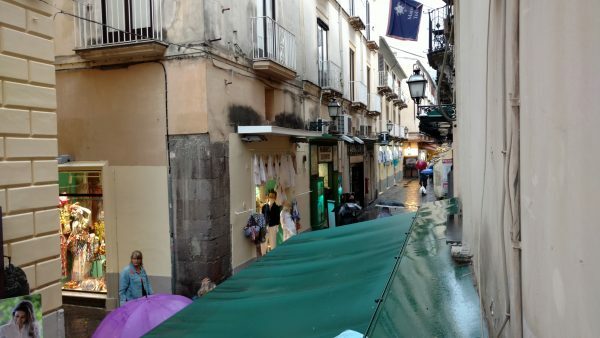 After a rainy night in Sorrento, we woke early the next morning and walked to the train station. Although the streets were dry, I threw my umbrella in my backpack-just in case. We arrived in plenty of time to buy our tickets for the trip to Pompeii and have a cappuccino at the station. 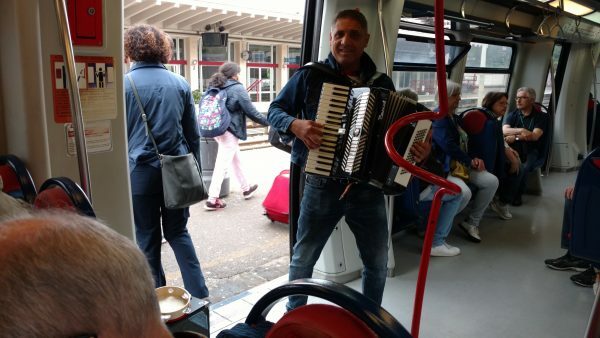 As we waited for the train to depart, an accordion busker stepped aboard. He placed a portable karaoke machine down by the door and began playing Italian greatest hits. 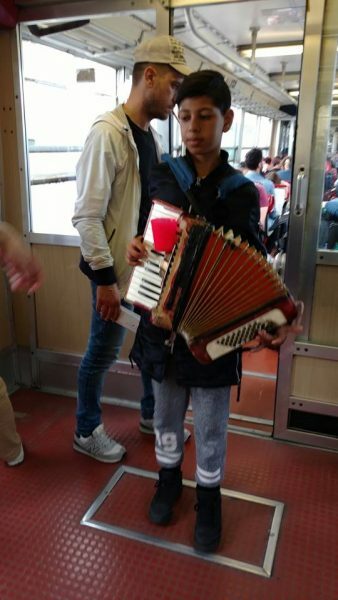 He did not get a good reception from the commuters (too early for accordion music?) and left the train just before it departed with not many euros in his tip jar. I thought about the young boy from the day before ( see my previous post) and the life cycles of a Sorrento street busker. O Sole Mio, Volare, That’s Amore…The man may age, but the songs remain the same. 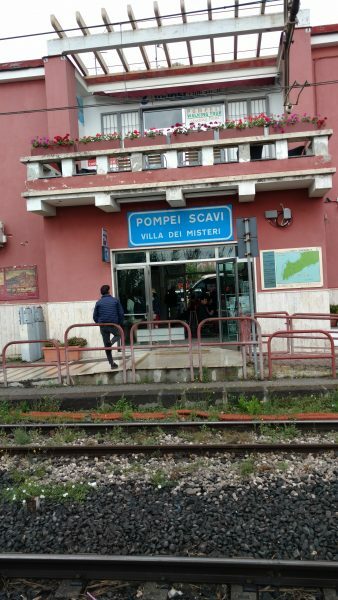 The train stops at Pompei Scavi. Right near the station is a place to buy tickets to the ruins, from there it’s a short walk to the site. 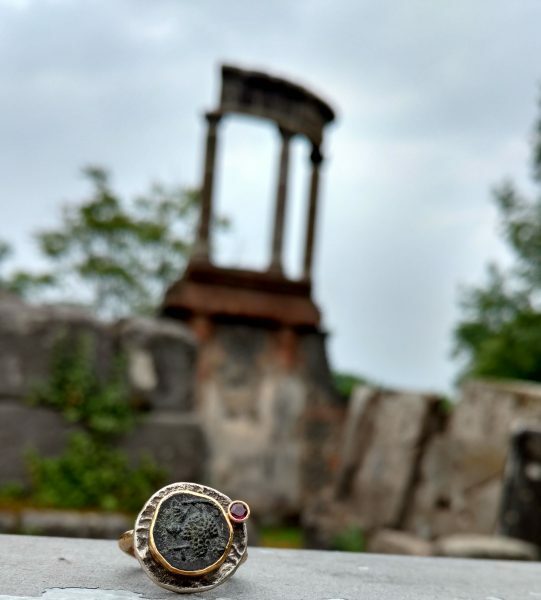 Pompeii was once a thriving city in the shadow of Mt Vesuvius. It had theaters, public forums, bathhouses, brothels, food producers, laundries and more. The population, estimated to be about 15,000, included all socioeconomic levels, from landowners to slaves. 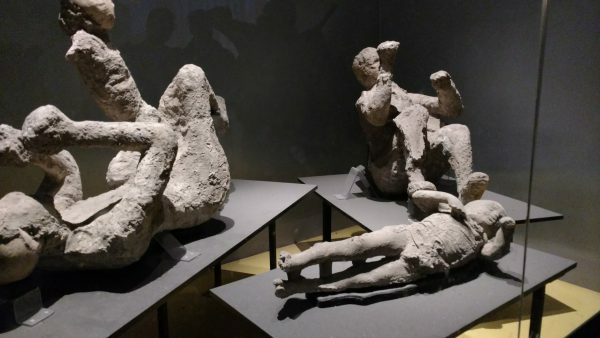 Despite the huge differences in lifestyle and social class, all inhabitants were equally defenseless on an October day in 79 A.D. when Vesuvius suddenly erupted. Rich or poor, there was no escaping the torrent of hot ash and pumice that rained from the sky, smothering all life equally. After that, the city slept for over one thousand years under the ashes. 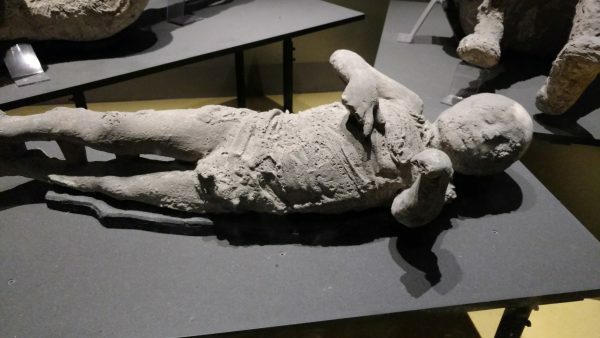 Plaster cast made of a child’s body at the moment of death. This golden bracelet (weighing 0.6 kg) was found on the body of a woman inside their richly decorated villa. We walked down a path that led to the Antiquarium, a combination visitors center and small museum (rebuilt in 1947 after being bombed in WW2.) 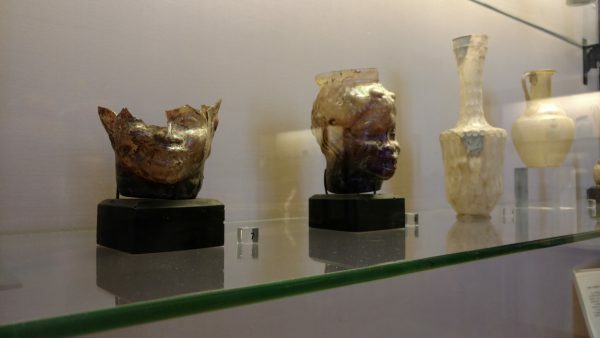 While most of the treasures recovered from Pompeii are housed in the Museo di Archeologico in Naples, there are some exquisite pieces displayed here, including glassware, furniture, paintings, jewelry, and coins. In sobering juxtaposition to the luxury of these items are the casts of a family who perished during the eruption. 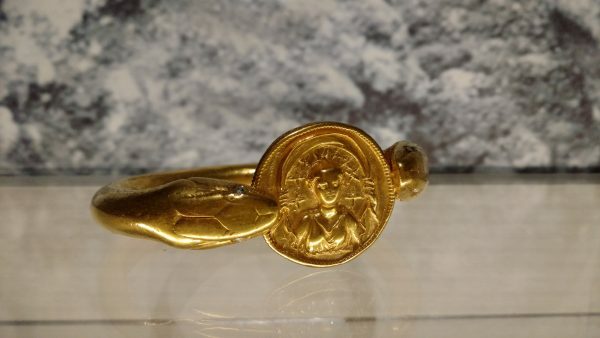 Archaeologists dubbed their home the House of the Golden Bracelet, because of the precious piece of jewelry found during excavation. During excavation at the House of the Golden Bracelet archaeologists found the bodies of a family killed by a staircase that collapsed as they tried to leave their home. Casts were made of the child, man, and baby seated on its mother’s lap in the final moments of their life. After looking at the displays in the gallery, we headed out with the small printed maps received with our paid admission to explore, forgoing the guided tour that was heavily suggested. 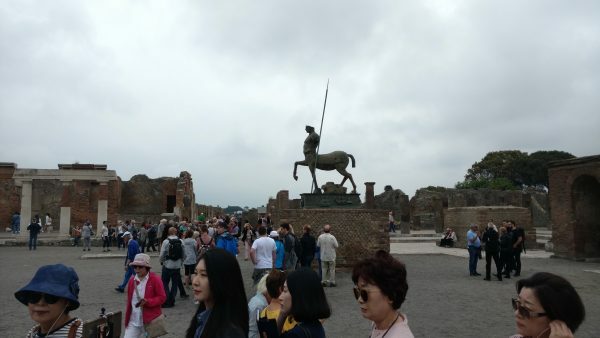 Pompeii is vast, and there is a lot to see-too much for one day. 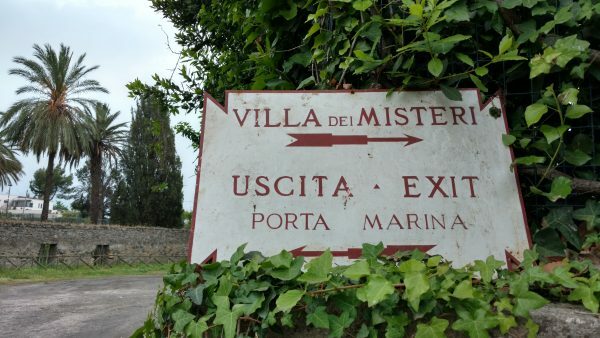 I wanted to start at the one place that was highest on my personal list-the Villa of the Mysteries. My friend Dennis had no real tourist agenda and was happy to accompany me to the Villa. Located on the outskirts of the city, we walked along a road where chariots once rolled. We passed by the Stabian baths, a brothel, the House of the Faun, the House of the Tragic Poet and more, saving these to explore on the way back. 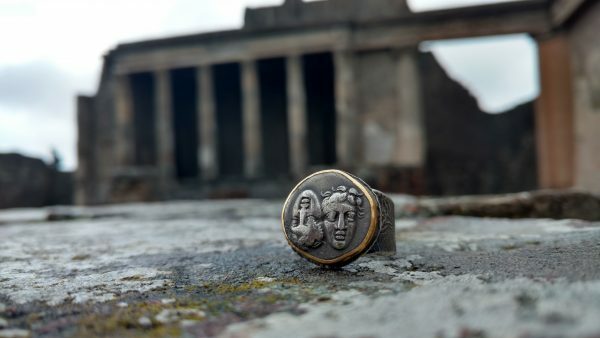 Along the way, I did pause to shoot a few jewelry photographs in the of the cemetery of Porto Ercolano, the crumbling tombs, and monuments providing the perfect context for the ancient coin rings. 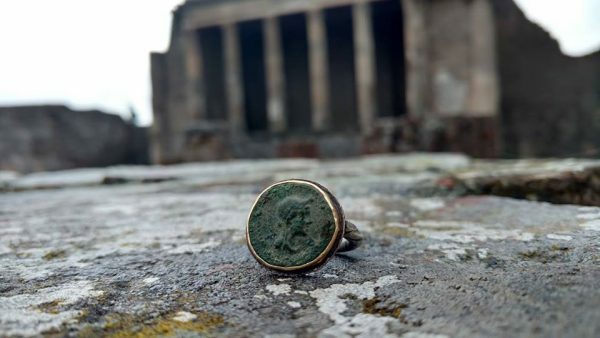 Larrisa ring, ancient Greek coin, silver, with coral. 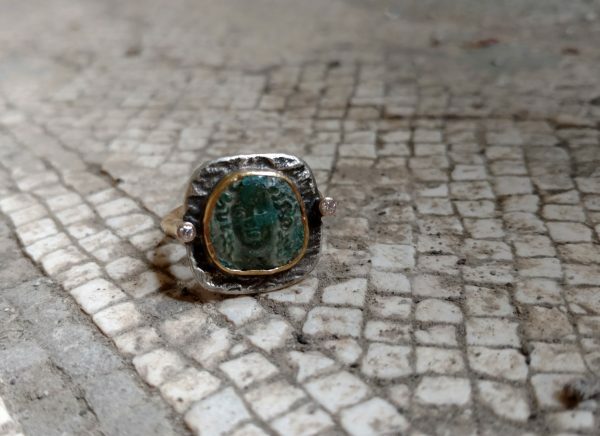 Dionysus ring-ancient Greek bronze coin depicting grape cluster, gold, silver, ruby. Along the road that once led from Naples to Rome. 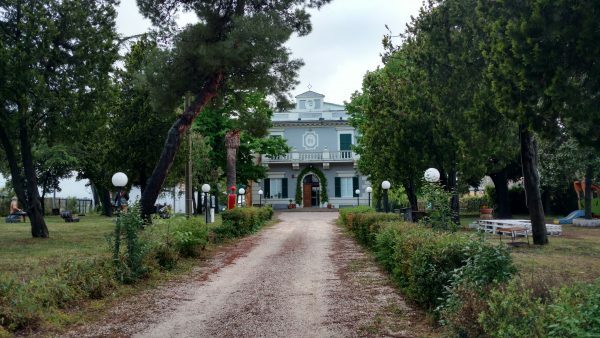 There were few tourists around as we neared the entrance to the Villa. The air was fresh with the smell of flowers and the sweet singing of birds. The season of spring infused life and vitality to the sleeping city, a reminder that everything is part of a cycle. Villa Dei Misteries, frieze depicitng Dioyisian rite. The colors are unbelievably vivid, the photos I took with the dim available light give an idea of how bright the pigments have remained, even after about two thousand years. 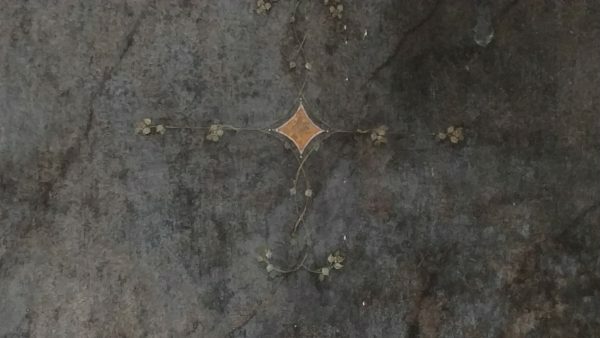 Elsewhere in the villa are beautiful examples of the ornamental style painting popular in the time, including a lot of Egypt-influenced imagery. These were beyond the capabilities of my camera to capture, so I am showing just one details here, for the color. 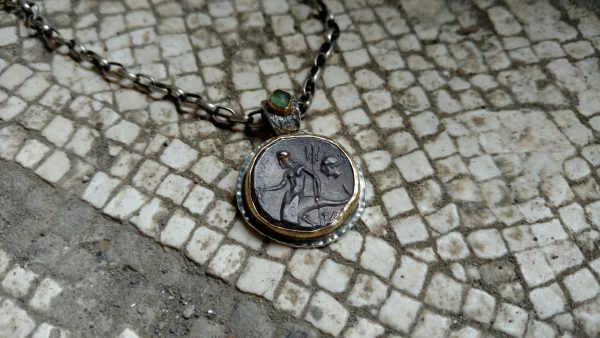 I could not resist placing my jewelry on the beautiful mosaic floor and taking a few photographs. Ancient Greek coin pendant, with gold, silver and sea glass. 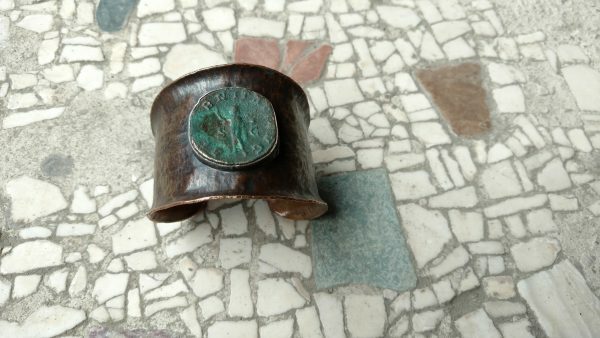 Copper cuff with Roman coin depicting the god Sol (sun). 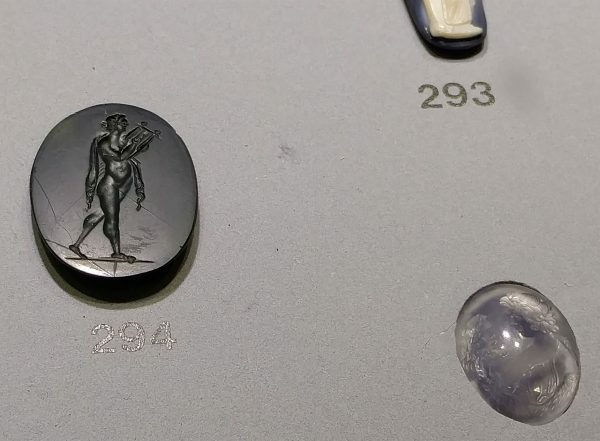 Ancient Greek nymph coin, with silver, gold, diamonds. There were only a few other visitors at the Villa when we got there around 10:00. I felt that nothing else I would see this day could possibly top this experience, and was glad to have been among the first there that morning. We met a lot of people heading to the Villa as we walked back down the road. We stopped to explore to see the previously mentioned sights we passed earlier, ending up at the civic forum. Pausing at a funerary monument, on the way back to the center. We had a lunch of pizza in the busy cafe, which was now bustling with tourists from all over the world. I really needed the food to get re-grounded after that visit. It was also a good thing we brought umbrellas as the sky began to pour. The moody lighting and lack of tourists (taking shelter inside) provided more opportunities to shoot jewelry in what would usually be the crowded civic forum. Ancient Greek silver coin, with silver and gold. 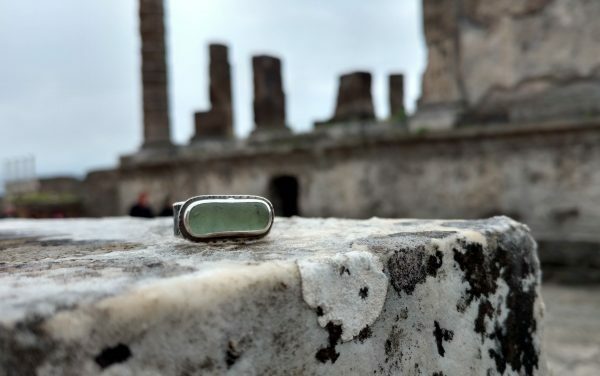 Sea glass ring in the civic forum. Demeter, ancient Roman coin, gold, and silver. By later afternoon, seeing as much as we could absorb for the day, we walked back toward the exit. I will definitely return to see what I missed another time. 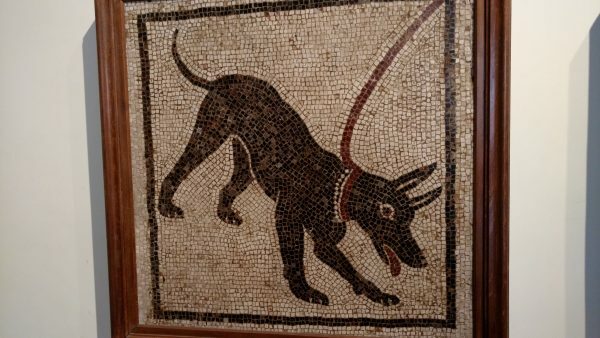 I will also see Herculaneum on another visit-and Paestum. 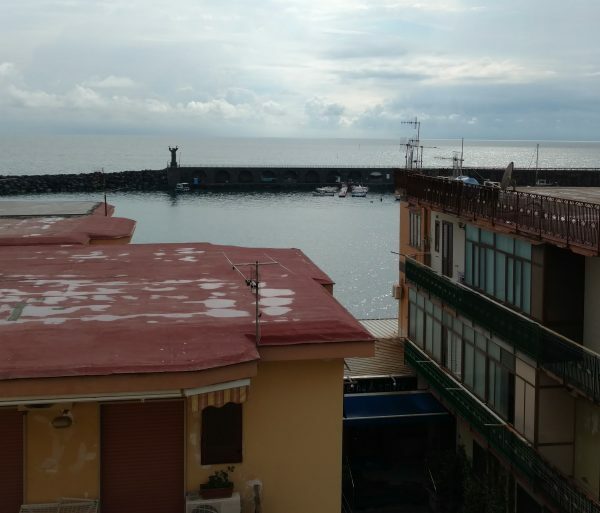 We still had another adventure in store that day, getting back on the train and heading to Torre Del Greco, to visit a friend, which will be the topic of the next post. Ciao! 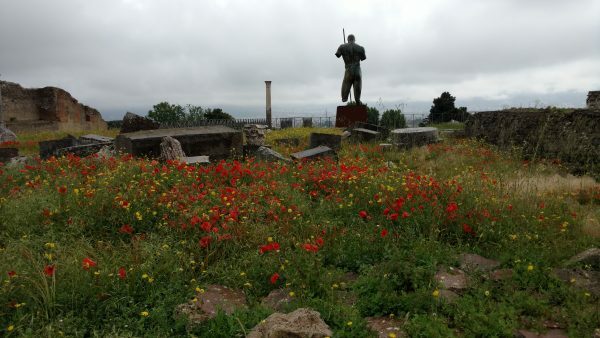 Final view of Pompeii dotted with red poppies and wildflowers. 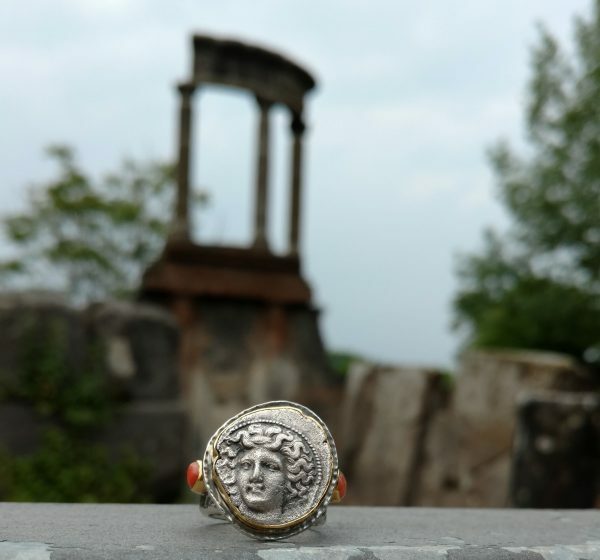 This entry was posted in Inspiration, italy, travel, Uncategorized and tagged #ancientcoinjewelry, #judithaltrudajewelry, #mytriptopompeii, ancient coin rings, Italy, judith altruda, pompeii on June 26, 2018 by admin. 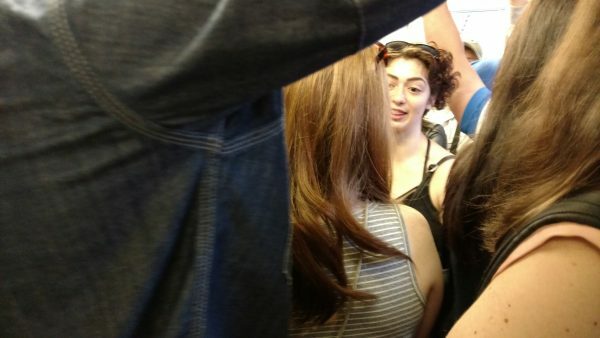 From Naples, we took the Circumvesuviana to Sorrento, squeezing onto the standing-room-only train, suitcases at our feet. The ride from Naples to Sorrento took an hour. I was glad we were there before the hot summer season approached! 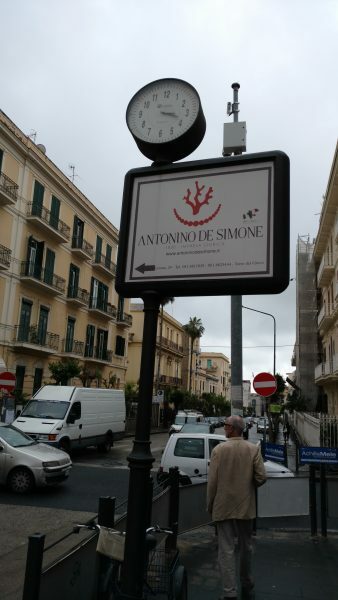 When my friend and I were planning this trip, we reserved four days in Sorrento. Both of us had been to Italy before, but never in the South. There is so much to see and do in this area! Of course, four days is not nearly enough. Our wishlists included: hiring a cute driver to take us sightseeing along the Amalfi coast, taking a boat to Capri, going to Pompeii and Herculaneum, perhaps hiking Mt Vesuvius, seeing the ruins at Paestum, and, oh yes, I hoped to meet in person an online friend and sea glass collector, Rebecca Di Donna, who lives in Torre Del Greco. When I was a kid, my grandmother often used the cautionary expression “your eyes are bigger than your stomach.” This adage relates not only to food but to everything, really-especially time. While I have always slanted toward Auntie’s Mame’s “Life is a banquet” outlook, sometimes less really is more. My advice to those planning a trip; don’t overfill your dance card. Slow down and savor the details, leave room for the unexpected. As arranged, In the town square we met Max, who was sent by our air b&b host to guide us through the maze of streets to our destination. 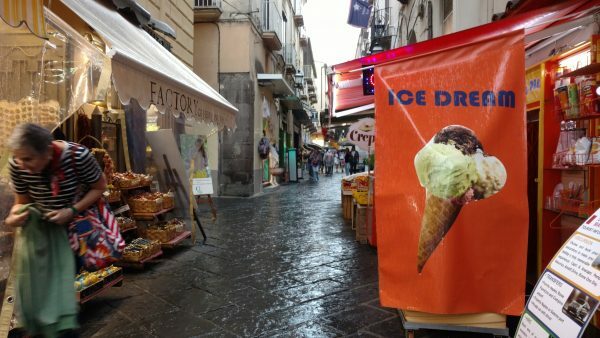 After Naples, this resort town felt a bit like Disneyland, filled with tourist shops and higher priced restaurants. As we followed Max, I eyed the goods displayed in front of stores-leather purses, ceramics, lemon-based gifts, resort fashions, jewelry and more. We turned at a gelato stand and went back from the street to our air B&B. 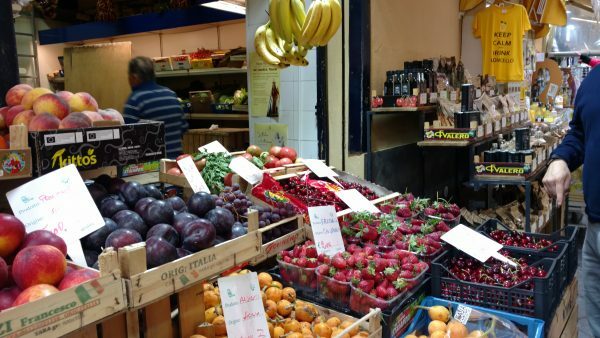 Casa Torino was located above a florist shop in the heart of old Sorrento. It was airy and comfortably equipped, with a full-size kitchen, fold out couch on the lower level and an upper sleeping loft. We had a view down to the street below and could watch the interplay of tourists until a heavy rain started to pour, bringing an abrupt end to the activity below us. The view from our apartment, rain emptied streets. Max offered the services of a private driver for an Amalfi coast tour, and to put us on the passenger list for a small boat to Capri if we were interested. We decided to make reservations for both at the end of the week when hopefully the weather would be better. We settled into our new place and then decided to go out and explore in the rain. We ventured out with those umbrellas bought in Vasto. The late afternoon streets were empty, many outside displays were covered with tarps. 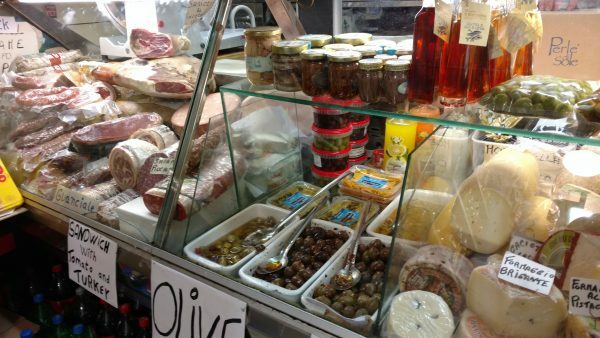 Hungry, we shopped for cibo e vino at the local deli and fruit stands, and yes, my eyes were bigger than my stomach! Life really is a banquet! We returned to our cozy apartment with wine, fresh baked pane, salami and cheese. 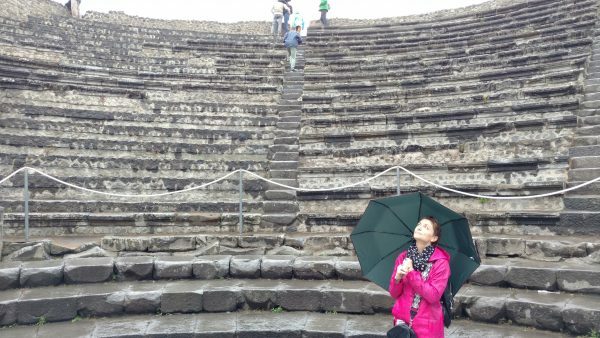 Tomorrow we would spend the day exploring the ancient ruins of Pompeii-rain or shine. 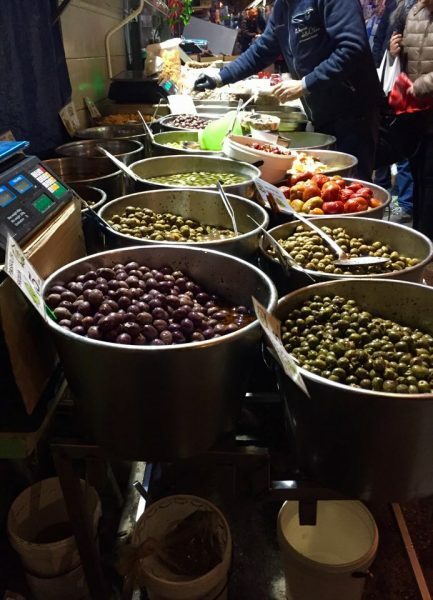 This entry was posted in Inspiration, italy, sea glass, travel and tagged accordion, airb&b, circumvesuviana, food and wine, italia, Italy, judith altruda, judith altruda jewelry, life is a banquet, sorrento, travel on June 19, 2018 by admin. 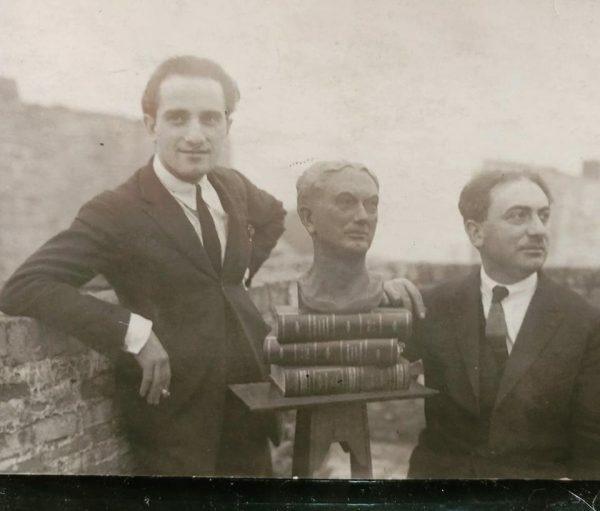 After Vasto, we hopped on a bus and rode across the country from the Adriatic coast to the Bay of Naples. It was a rainy, three-hour ride. I was glad we’d cancelled the car rental and could relax and take in the scenery with no concerns. It was a nice way to transition from the peace of Vasto to the chaos of Naples. 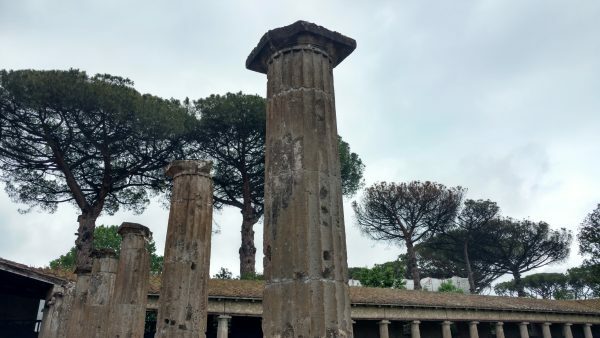 In this post, I will share my experience in Napoli, and highlight a visit to the National Archaeological Museum of Naples. 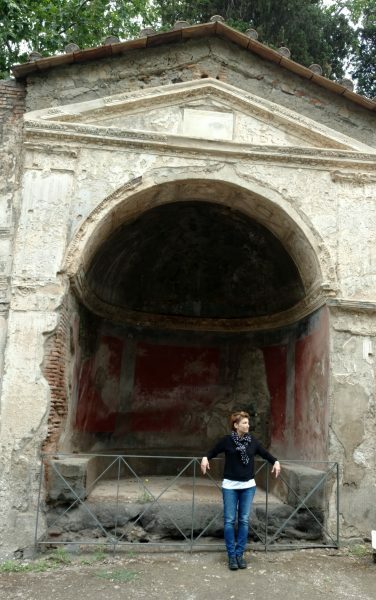 So if you love ancient art, gritty cities, and pizza-stay with me! 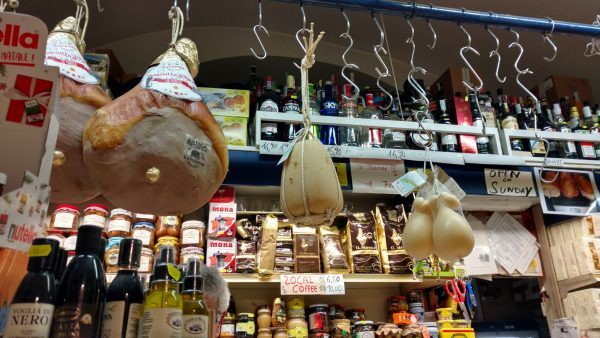 Naples has a reputation for crime, especially pickpockets. I tried not to let the warnings I read on travel blogs make me feel uneasy or paranoid. Well-meaning friends also primed me about various scams perpetrated on tourists, especially in train and bus stations. The day before I left an acquaintance who had lived in Italy for a few years urged me to buy a money belt, “at least for Rome and Naples.” I chose to forgo the security belts and go with what I was planning to wear-my new Rebecca Minkoff crossbody bag. I feel that once you give into the fear of what might happen, its a slippery slope from there. The anxiety vibes you send out might actually attract the very thing you are afraid of. 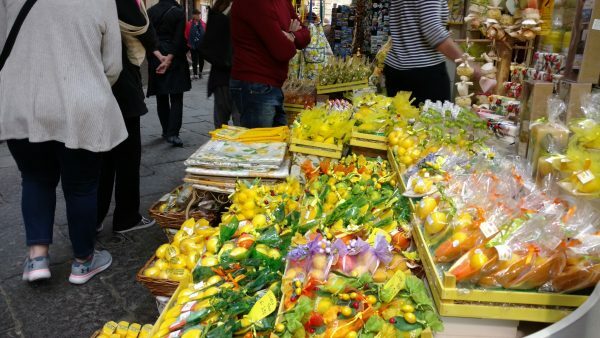 We felt a tad uneasy when our freelance taxi driver, (who had assured us he knew the address to our accommodations when we engaged him) stopped to ask directions various times from street vendors in L’Antica part of town. 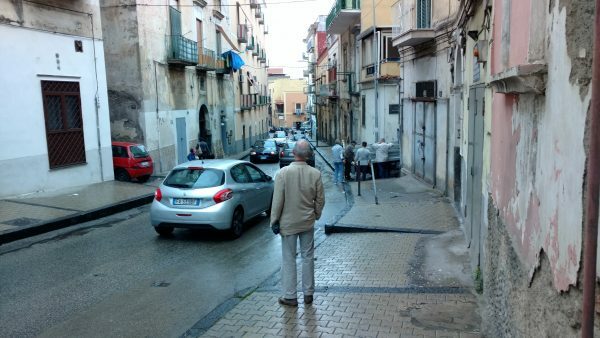 Our uneasiness grew when he suddenly stopped the car, saying “sei arrivato” in a no-nonsense tone of voice. He got our bags out of the trunk and gestured toward an alley, telling us the place was only a few blocks away, then hurried off. 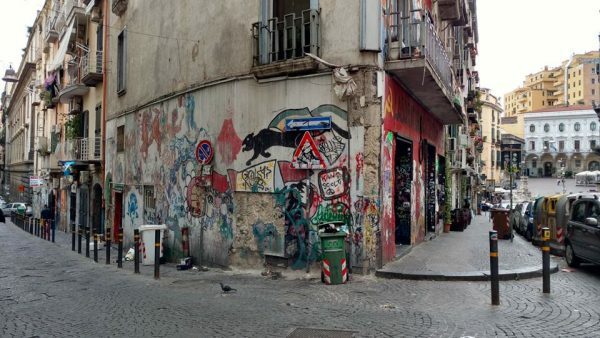 We rolled our suitcases along the bumpy pavement, feeling very conspicuous as we looked for address numbers on the graffiti-sprayed walls of a dark alley. Vespa scooters wove around us as we walked and the heavy air was filled with the sound and smell of traffic. Children shouted up to laundry-strewn balconies and were answered by adults who peered down at us from above. It did not seem possible to me that we were ever going to find the address, and for a moment I silently wished we had kept it simple and stayed in a centrally located hotel. But we had wanted something “more authentic” and were getting exactly that. We eventually found it and rang a bell on the outside of an iron security gate. My enthusiasm returned as Marco, our host, promptly answered. Siamo arrivati! The small apartment where we would spend the next two nights was windowless and sparsely decorated on the lower level but had all the necessities. Upstairs was a sleeping loft with two beds separated by a folding screen and french doors that opened onto a balcony. 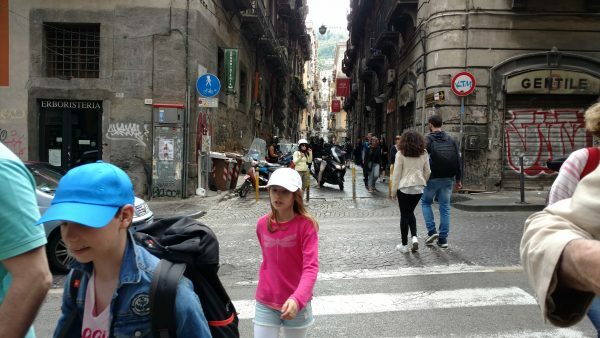 Marco gave us some tips on exploring Naples, (warning us not to go back the way we came at night). 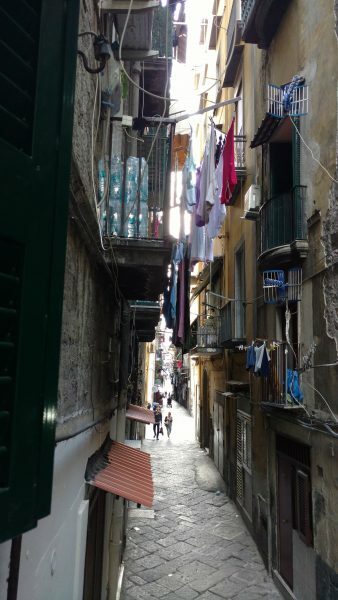 We headed out onto the Corso Umberto, the main thoroughfare which our small alley opened onto. 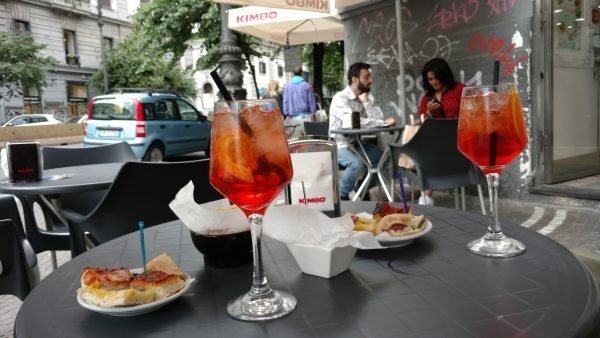 To celebrate our arrival in Naples, we stopped at a nearby bar for an Aperol Spritz. Later for dinner, we decided to try Michelle’s, the most famous pizzeria in Naples, which was a short walk from our alley. It’s a tiny place, nothing fancy. Just pizza. Many of the customers order takeaway and sit out on the street curb eating their pizza out of the box. The entire street was swarming with customers, waiting to get close to the entrance. This went on for hours. We decided to try the restaurant across the road and were not disappointed. The pizza had fresh yellow tomatoes and basil leaves with mozzarella di bufala and a great crust. While in Italy we had pizza in every city we passed through, but the memory of this one stays with me the longest. The next day, we visited the Museo di Archaeologico. 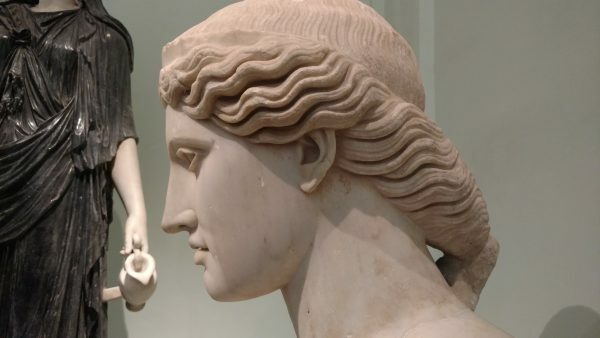 An incredible museum offering four floors of sculpture, painting, mosaics and other objects from Pompeii and Herculaneum, as well as the Farnese collection of antiquities. On the day we visited, a contingent of Star Wars cosplayers were there for a Star Wars memorabilia exhibit on the lower floor, near the Egyptian collection. I wondered what Joesph Campbell would say to that! Artemeis of Ephesus is a copy made in the Imperial period. 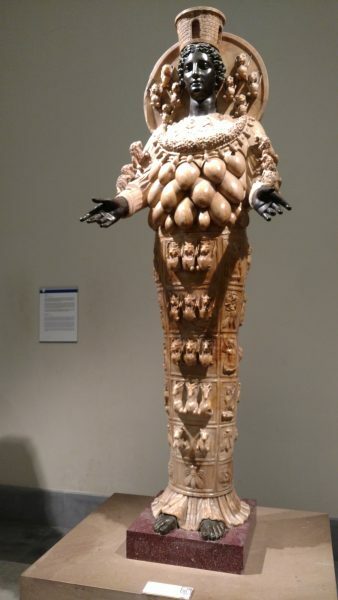 She is made from alabaster and bronze. Her hands would have held a ribbon. 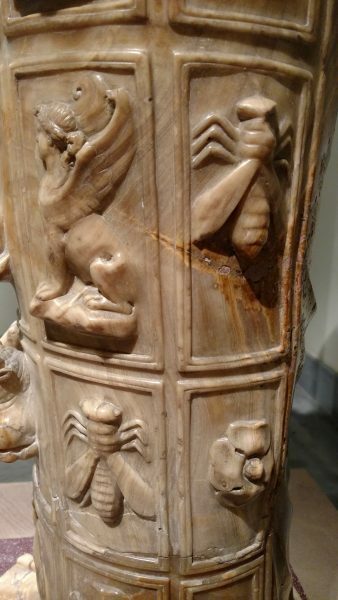 Detail of her richly ornamented dress, alabaster. The collection includes all the exceptional finds from the Vesuvian cities of Pompeii and Herculaneum. 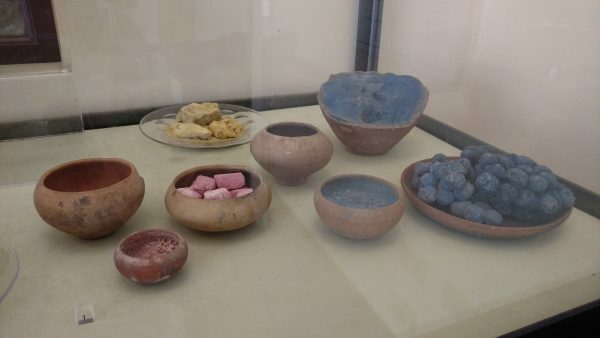 Later in the week, when we visited Pompeii I had a greater appreciation, after seeing these treasures, for the way of life that had suddenly ended when Vesuvius erupted in 79 AD. 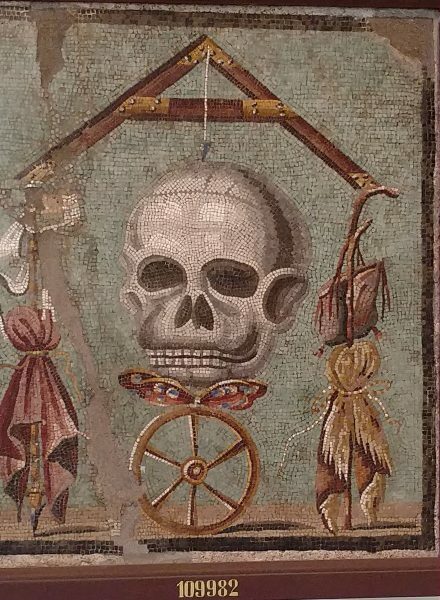 Memento Mori, representing life and death as the leveler of human fortunes. Detail The Farnese Gems, collected during the Renaissance. Many were made from glass. Artist pigments and mixing bowls. 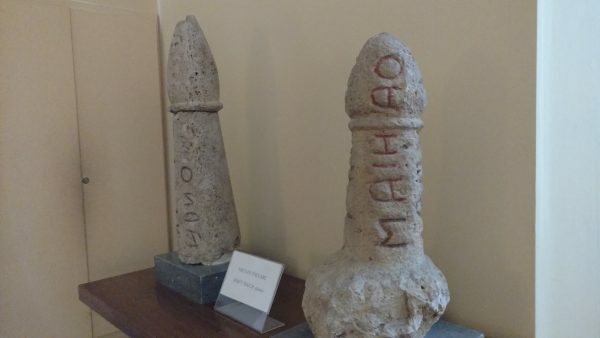 From the Gabinetto Segreto (Secret Room), displaying erotica collected from Pompeii, Herculaneum, and the Villa Farnese. The Secret Room has been opened or closed to the public depending upon the political climate and morals of the time. 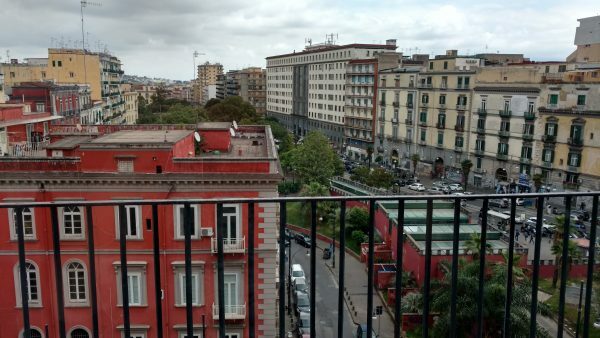 View from the Museo di Archaeologico. I did not attempt to photograph much of what I saw, preferring to hold the impressions in my mind, but hope what I have shared here is of interest and inspiring. After the museum visit, we walked around the streets, grounding ourselves by taking in some sights of everyday life. 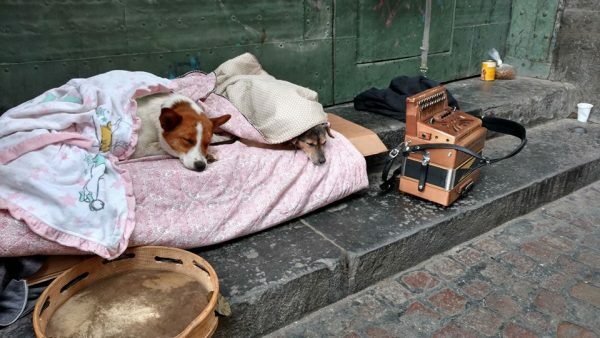 The dogs of street buskers. 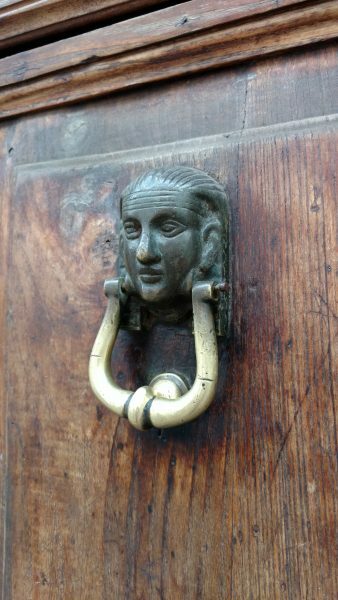 Door knockers are one of my favorite things to “collect” with a camera. 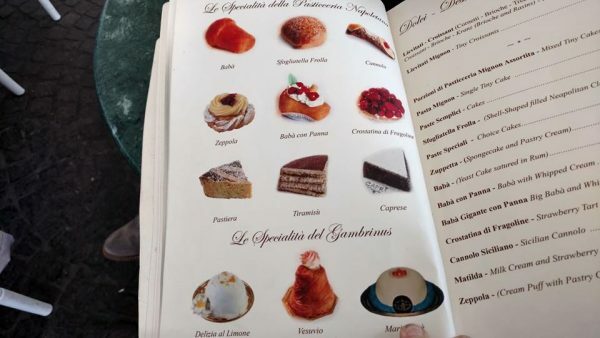 We took the advice of Ornella and had a caffè and dessert at Gambrinus. It was the perfect way to refresh and get a second wind for more sightseeing. Thanks for staying with me for this many words and images- see you soon! 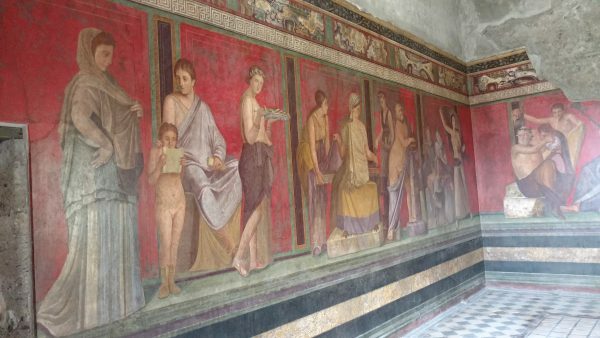 This entry was posted in Inspiration, italy, travel, Uncategorized and tagged ancient art. 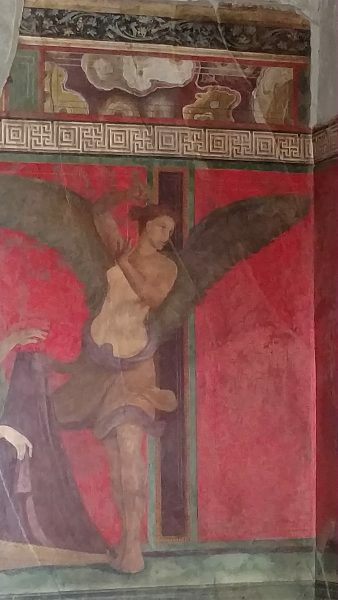 museo di archaeologic, judith altruda, Naples, napoli, pizza, pompeii on June 12, 2018 by admin. 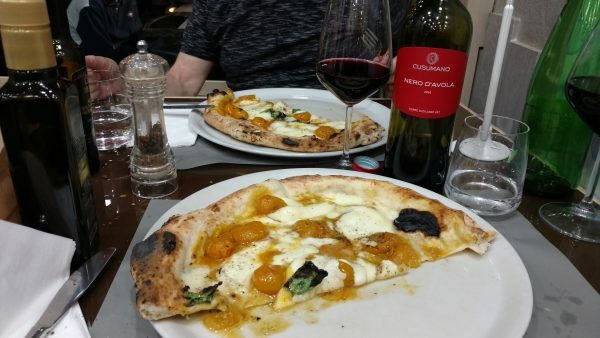 The dictionary says “when you savor something, you enjoy it to the fullest.” More than any other single word I can think of, Savor describes the way I feel about my recent trip to Italy. I’m savoring the memories, the sights, the food, the great people, and already thinking about my return. 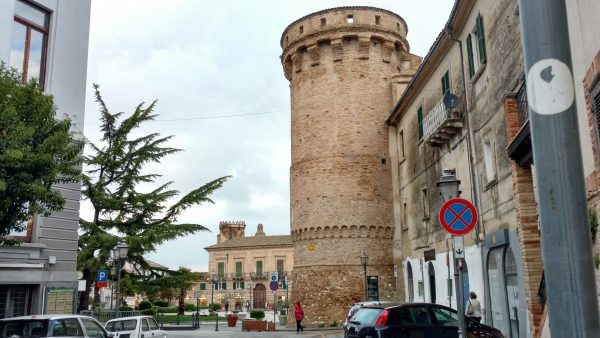 Until then, I will share some of the highlights in a series of posts, beginning with this one, about Vasto, the town of my paternal grandfather’s family. 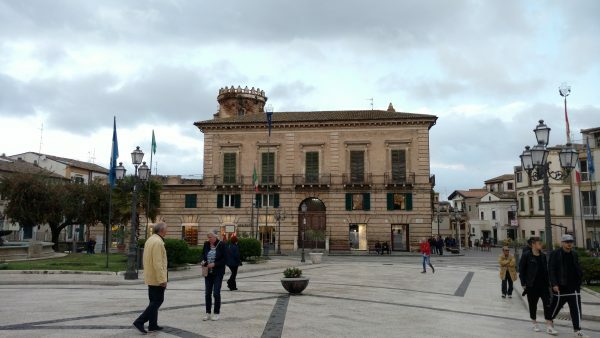 Even if I had no ancestral connection to this place, I would have fallen in love with this “ancient Roman town in the heart of Italy” and perhaps you will too! 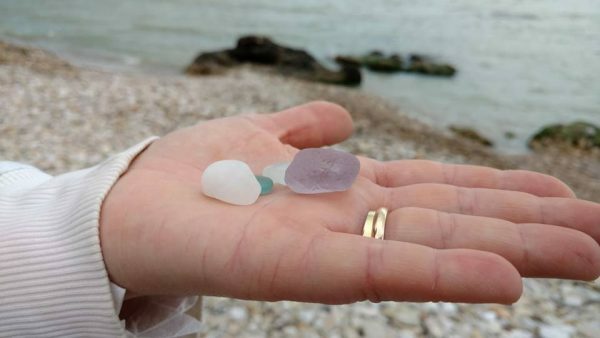 As I shared in my previous post, it was through the sea glass world that I met Ornella Di Filippo, who lives in Vasto and operates a very comfortable Air B&B, where we stayed. She and her husband, Marco, were wonderful hosts-even loaning my friend Dennis and me clothing to wear (did I mention our luggage was lost in Rome?) until our bags were sent to us by the airline a few days later. I had packed for the sunny warm days that were predicted, but found myself buying an umbrella and rain slicker, because of the heavy rain the greeted us! That, of course, did not keep us from hitting the beach in search of sea glass on our first morning there. Thunder, lightning, rain and wind-note the inside-out umbrella of Dennis! When you live in Washington State, it takes more than a little rain to keep you off the beach! We walked down a path to the beach, serenaded by birds, passing by giant fig trees and eucalyptus, which made me feel like I was back in Southern California. The air was perfumed by the sweet blooms of flowering acacia trees mixed with the smell of the sea, which Italians call Salsedine. 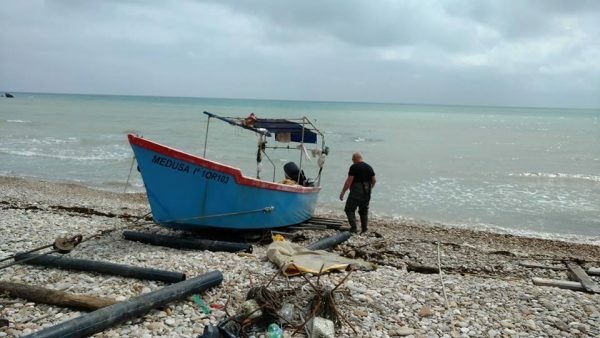 We were the only people on the beach that morning, save for a couple of fishermen who brought their skiff in later. 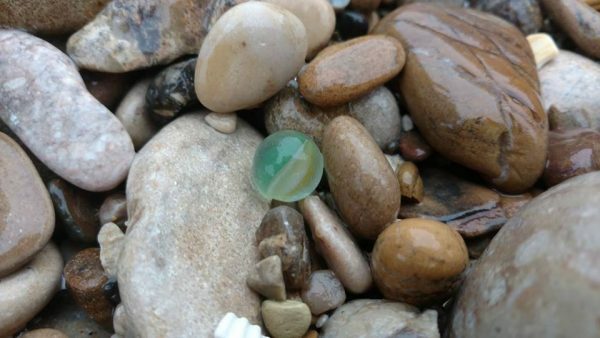 There were many shells scattered amongst the rocks and lots of sea glass too! 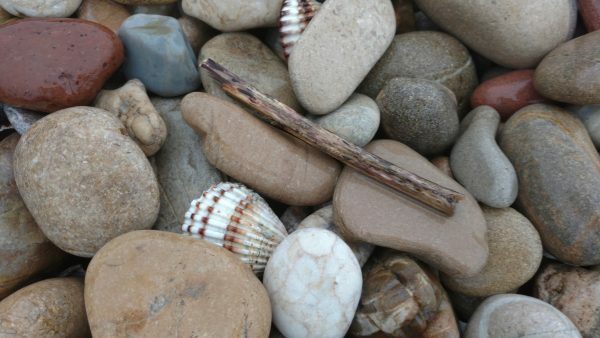 I found a beautiful marble in the shingle! 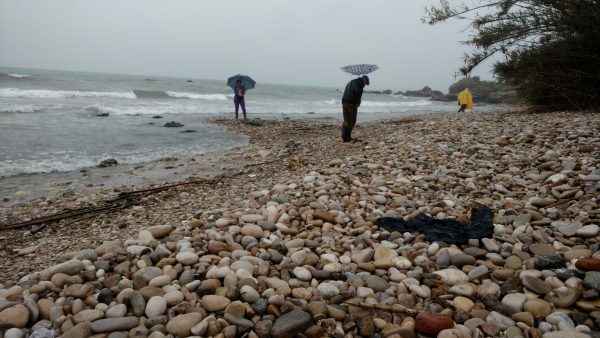 Even with all the rain, the air temperature was warm, and we spent the entire morning going to a few individual beaches, known to Ornella and Marco for their sea glass. 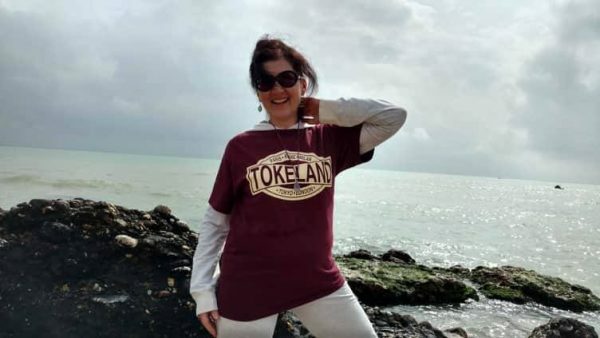 Ornella Di Filippo, now flying the flag of Tokeland in Italy! 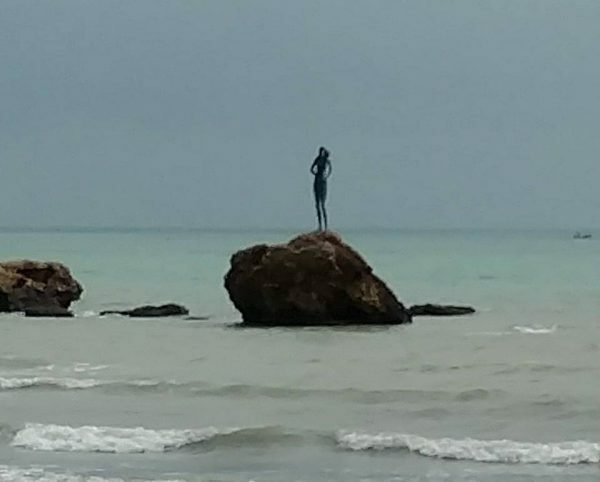 Before our three days in Vasto were up, the sun did come out, and Ornella and Marco made sure we went back to the beach to see it’s “true colors” of vivid green and blue water. Again, we were the only people out there, except for the two fishermen. 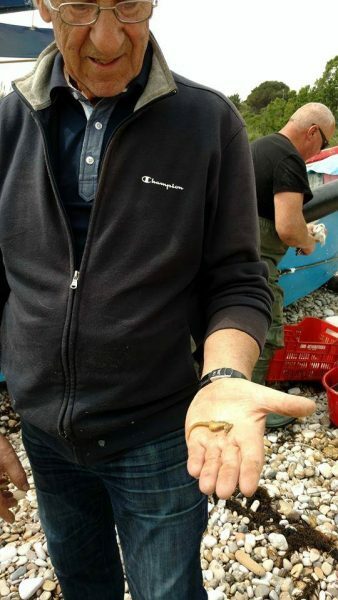 This fisherman showed me a live seahorse that was part of the catch. After I took this photo, he returned it to the sea. 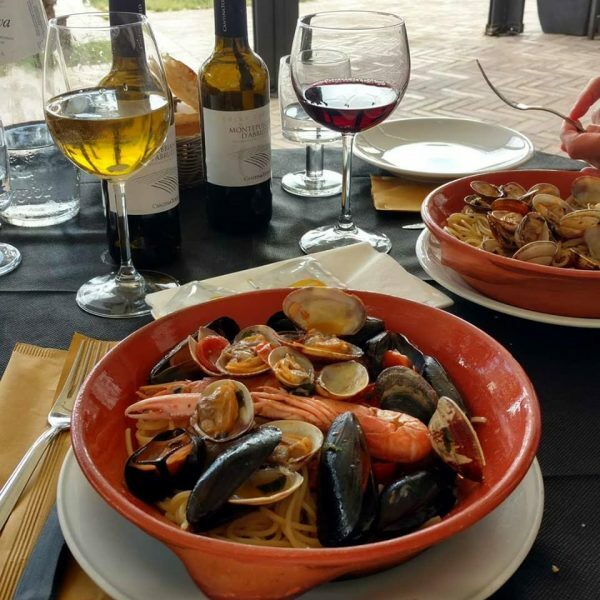 Vasto is known for its fresh seafood, and we enjoyed clams, mussels, prawns, octopus, scallops in one form or another, every day. Served with local wine, Montepulciano DÁbruzzo, these were meals to savor. 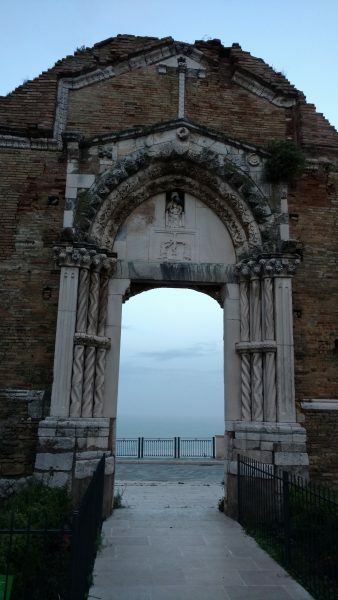 I was surprised to learn that Vasto has a population of about 40,000. It really didn’t seem that large to me. There was none of the heavy traffic or crowds, but plenty of shops, restaurants and other businesses. 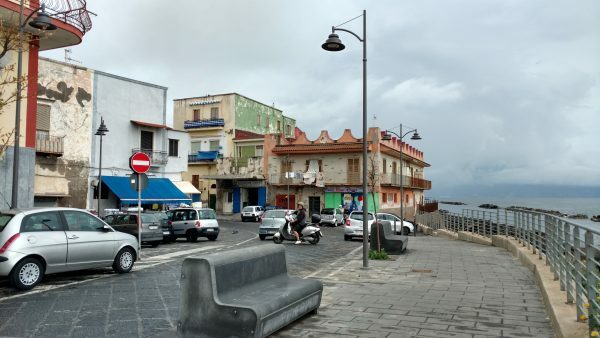 We could walk into the heart of town from Ornella’s place, following the road that paralleled the sea. 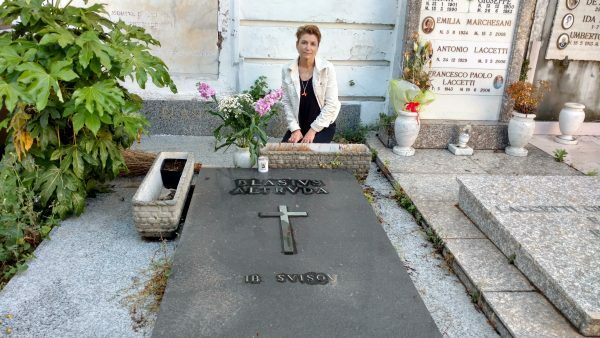 Using the photos in my grandad’s old album as a guide, Ornella and Marco took me to the places in Vasto where my family had lived, and where they are buried. 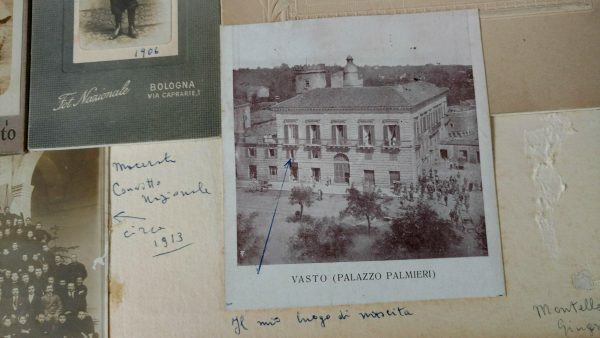 The Palazzo Palmieri-what a thrill it was for me to see the place of my grandfather’s birth! 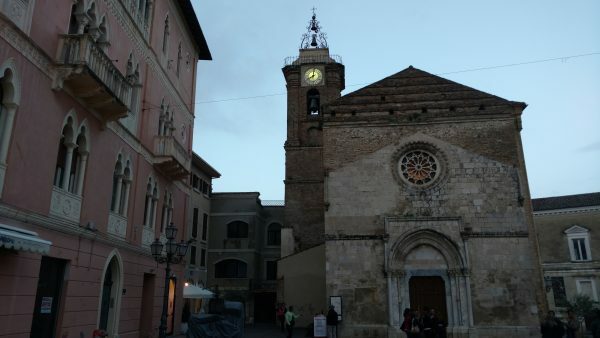 There are some lovely churches and the relics of ancient Roman baths, so many charming sights that I feel they deserve a seperate blog post of their own. So I will stick here to my personal sightseeing, and hope to revisit this topic in a future post. Note the Venetian style architecture of the building to the left-I love the color! 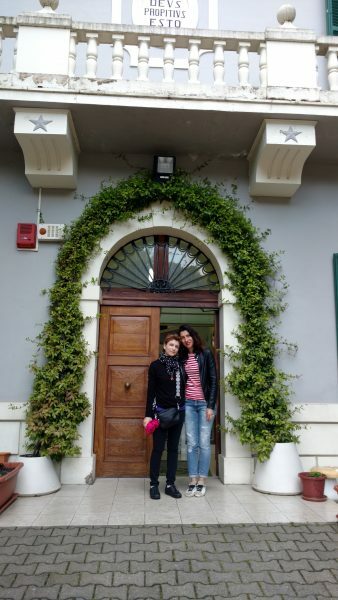 Ornella arranged for me to see the inside of the house where my family lived until the 1980’s. It is now used as a kindergarten/day care center. 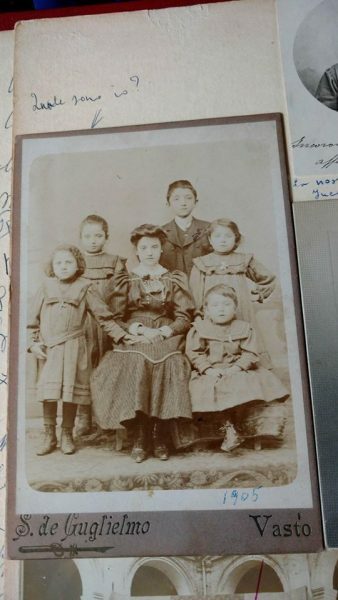 My grandfather with his siblings, circa 1905, Vasto. What a lovely place to grow up! Me and Melania, who operates the Mary Poppins childcare center. 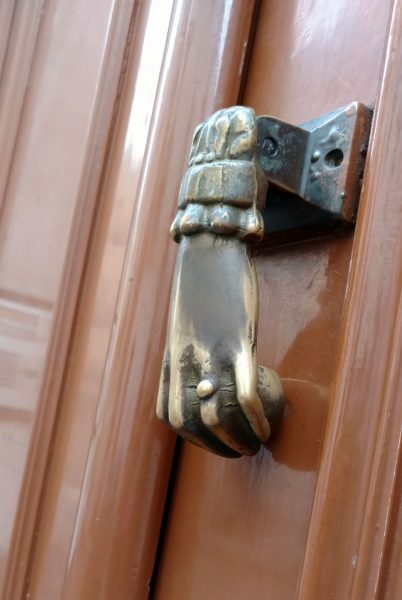 at the front door of our former family home. On my last day, we visited the cemetary. 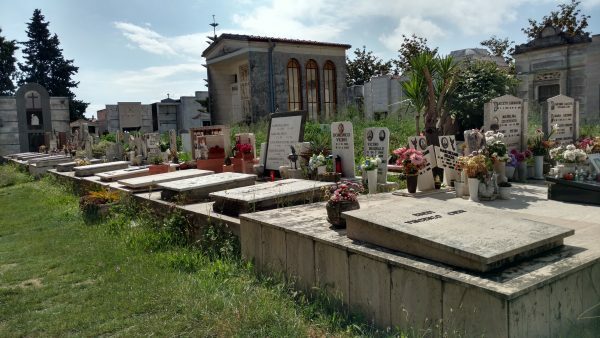 This too, deserves a post of its, own, but I will say briefly, that the cimetario is it’s own little villiage, filled with family mausoleums and graves, well tended and at the same time, overgrown in places. 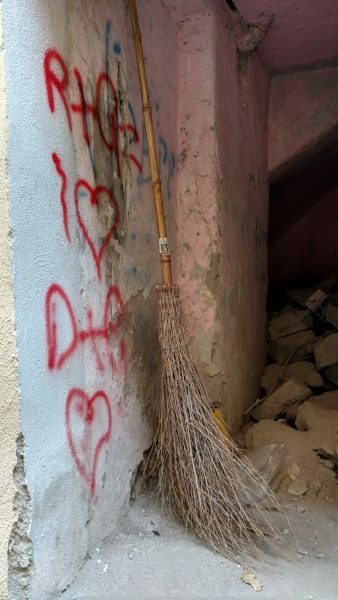 Individualistic touches and personal remembrances are everywhere. Remembering my grandfather with fresh flowers. I’m going to end this post here, as I savor the connection to family. It was a great privilege to recognize and honor my grandfather, Giuseppe Altruda in the town of his birth. 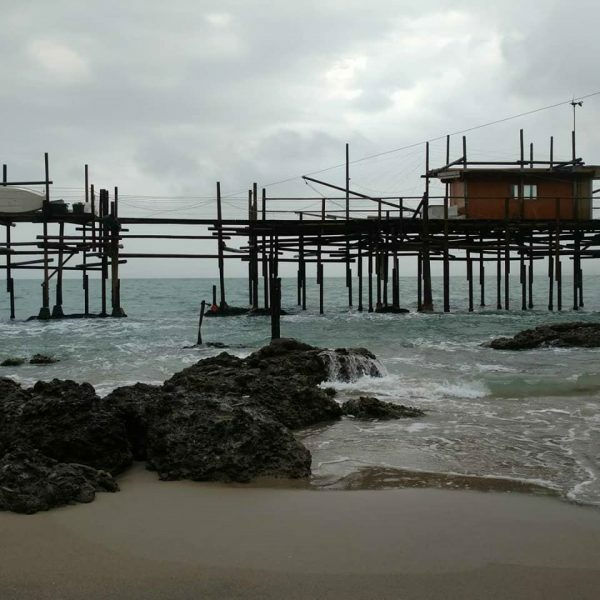 I must say a thousand thanks, Grazie Mille, to Ornella and Marco, and family, for their kindness in helping me to locate these special places, for the wonderful meals and the sea glassing. Ci vediamo lánno prossimo-see you next year! 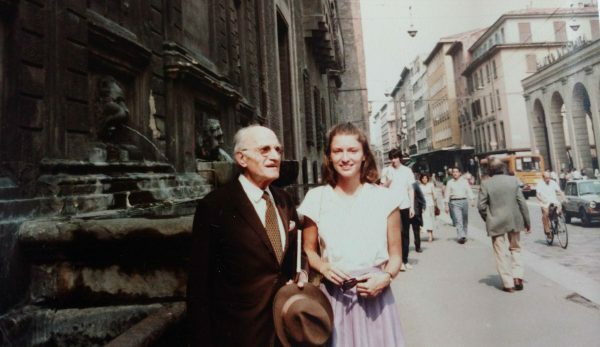 My grandfather and me in 1981, when I visited him in Bologna. This entry was posted in Inspiration, italy, sea glass, travel, Uncategorized and tagged Altruda, exploring my family ties in italy, italia, Italy, sea glass jewerly, seaglassing, travel, Vasto, Vasto Chieti on June 3, 2018 by admin.